Capacitors C4 and C5 are the power supply decoupling capacitors. 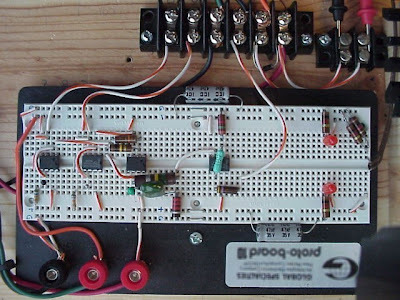 The circuit can be easily assembled on a small, general-purpose PCB or a Vero board. 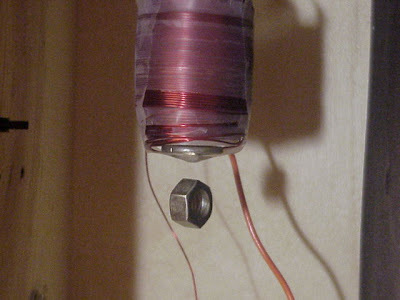 It operates off a 3V DC supply. 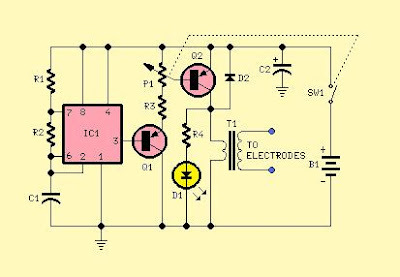 For this, you may use two small 1.5V cells. 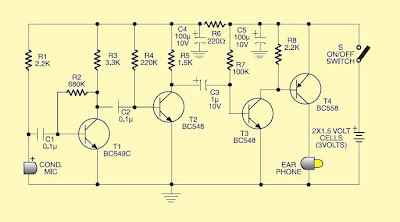 Keep switch S to ‘off’ state when the circuit is not in use. To increase the sensitivity of the condenser microphone, house it inside a small tube. 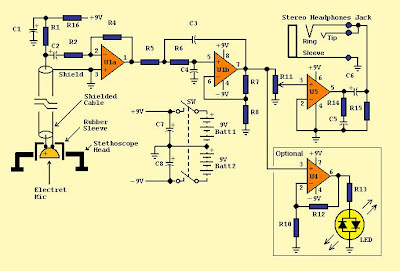 This circuit costs around Rs 65. 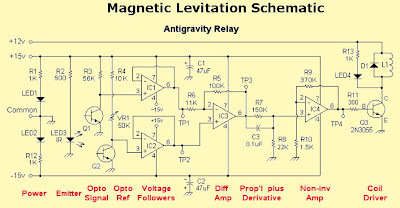 This circuit is intended to drive the various lights decorating the crib prepared during Christmas season at many homes in Latin Countries, especially for children delight, in order to obtain realistic light-effects. Alternating day and night with lights gradually dimming from full-on to full-off and the opposite. Slow turn on of model-houses interior as night approaches, and slow turn off as sun rises, with presettable intensity, thus imitating candles' light for a more realistic effect. Flickering ever-running circuit driving bulbs for fires, firesides, lanterns effects etc. Total cycle duration: 2 minutes. Day duration: 1 minute, 15 seconds. Night duration: 45 seconds. (All values are approximate). Input J1 is connected to a commercial wall plug-in power supply transformer adapter with variable output settled to 12-15Vdc, and a required minimum output capability of 600mA @ 12V. Using a good number of bulbs the output capability must reach about 1.5A. 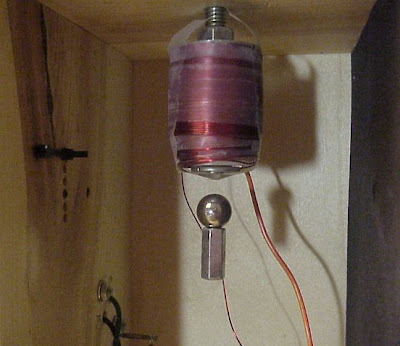 Output J2 is connected to a permanently-on 12V 1W blue bulb(s) for night effect. Output J3 is connected to several 12V 2.2W bulbs in parallel for sunlight effect. Max. 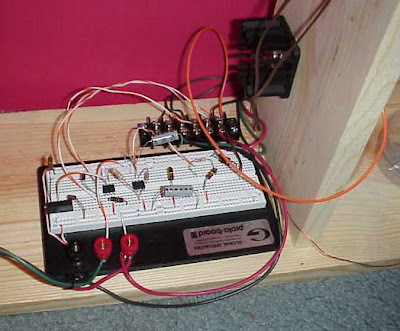 output current: 1.2A (i.e. 6-7 bulbs). Output J4 is connected to several 12V 1W or 1/2W micro-bulbs in parallel for house-interiors lights. Max. output current: 600mA (i.e. 7-8 1W bulbs, doubling in number if 1/2W). Output J5 is connected to one or several 12V 1W or 1/2W micro-bulbs in parallel for fires, firesides, lanterns effects etc. Max. output current: 600mA (bulbs total number same as above). All outputs are current limited, and short-proof for a reasonable lapse of time. IC1 oscillates at a frequency calculated to obtain a pin 2 level change around every minute. IC2A is then enabled to slowly charge and discharge C5 through R10 during a 2 minutes period. IC1 pin 9 drives D2, R3 & C4, generating a sawtooth for IC2C & IC2D comparators. IC2D comparing the voltage at pin 13 with the sawtooth, generates a squarewave with variable mark-space ratio driving the output darlington Q2 for daylight bulbs. 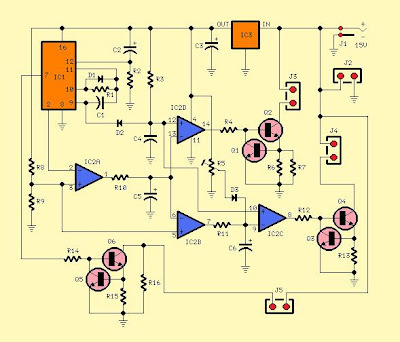 IC2B changes its output at a threshold voltage settled by R8 & R9, activating IC2C & Q4 that act like IC2D & Q2 driving model-houses bulbs as evening approaches and turning them off at dawn. R11 & C6 provide slow turn on and off and R5 sets the basic brightness of these bulbs. IC1 pin 7 drives the output darlington Q6 for flickering fires bulbs and R16 prevents them to turn off completely for a more realistic effect. Q1, Q3, Q5 and associated Base resistors provide current limiting. Total period length can be varied changing C1 and/or R1 values. Day-night ratio can be varied changing R10 value slightly. Threshold voltage of turn on and off of model-houses lights can be varied changing slightly R8 and/or R9 values. Turn on and off speed of model-houses lights can be varied changing R11 value. Current limiting can be varied changing Q2, Q4 & Q6 Emitter resistors. Heatsinks for Q2, Q4 & Q6 are needed if current limits are increased.